Blondie and Brownie: A Hot Fudge Sundae With a Cherry on Top, Plz! Until last week, I'd never stopped by Sundaes and Cones. There were many times I had planned on stopping by and many times where I had passed by after already eating one too many desserts. But last week, I'd not eaten any dessert that day, a day that was going sour quick, and then I passed by Sundaes & Cones, and, well, hot fudge beckoned. The previous weekend I had discussed this food writer dilemma (of not visiting a well-known ice cream shop) with Robyn Lee, who suggested I stop by as soon as possible. I stepped inside and became completely overwhelmed by the day's ice cream flavors. Then I spotted the waffle sundae options. 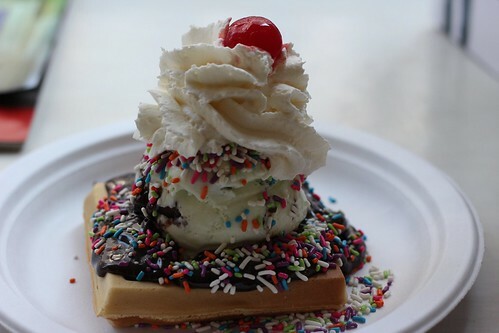 For about $7, I could have a scoop of ice cream, two toppings, whipped cream, and a cherry on top of a fresh waffle. Boom. Mint chip (I needed comfort--it's nostalgic for me), hot fudge, and rainbow sprinkles. It hit every spot it was supposed to. Would I stop by again for delicious creamy black sesame ice cream when the craving calls? Yes. Was it one of the better hot fudges I've had in the city? Yes. I could have done without the waffle--I don't think it added much--but every other aspect of my sundae was perfect. That looks AMAZING. I love Sundaes and Cones! I plan on stopping by more often. They have my favorite, black sesame!